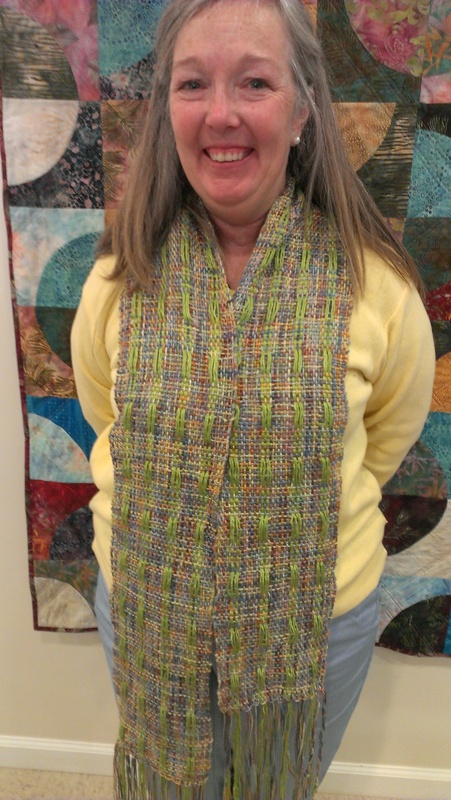 On Monday and Thursday evenings, Halie comes to my studio for weaving lessons. She is a student of Interior Design at DAAP at the University of Cincinnati. She is thinking about a Master’s Degree in Textiles and wanted to learn to weave. 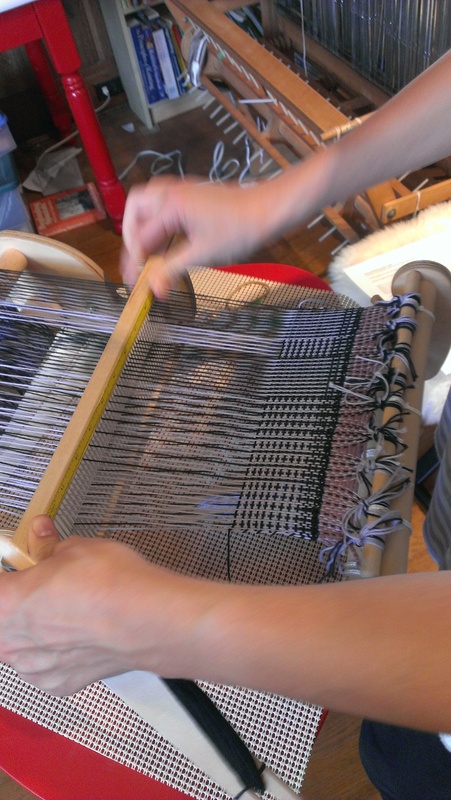 We started working on a rigid heddle loom since it is small and quick to learn about plain weave. 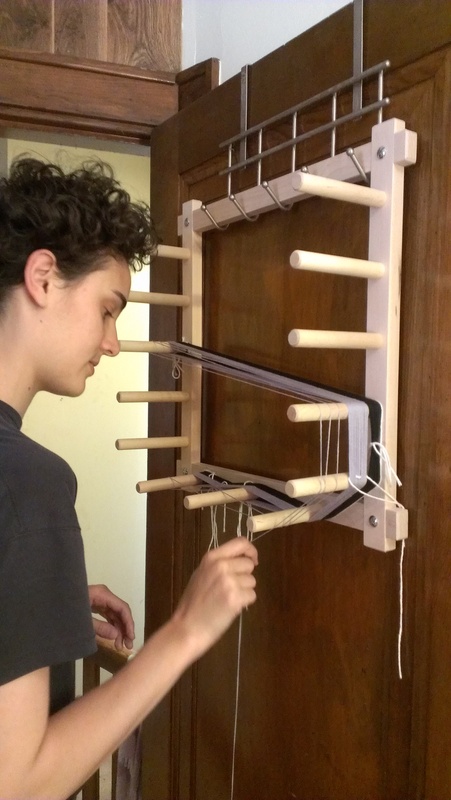 It is also a loom she can afford, can easily transport and can easily keep in different student housing situations. We will move on to a 4 shaft loom in the fall when she returns to school from a month of study abroad beginning in August. She made two scarves that she direct warped to learn the basics, one with a multicolored yarn that gradually changed colors and one in a houndstooth check. 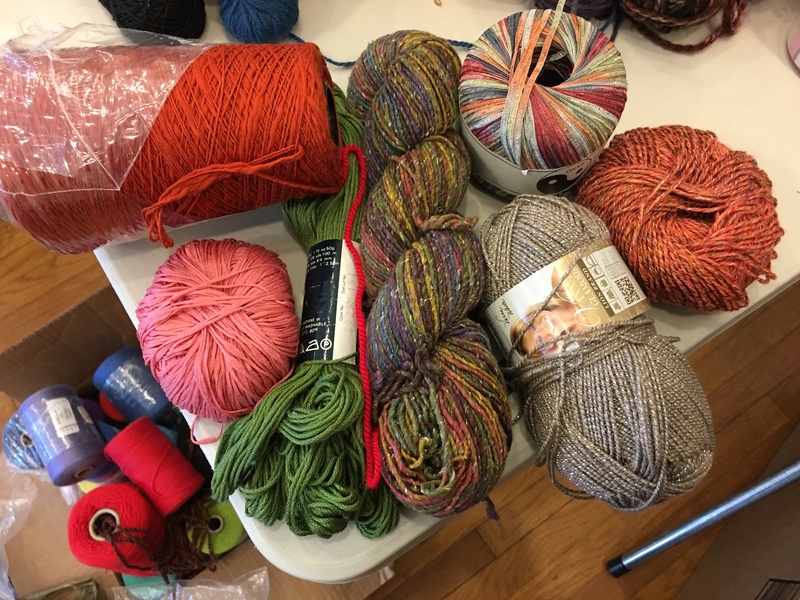 Then we moved on to a color and weave sampler. 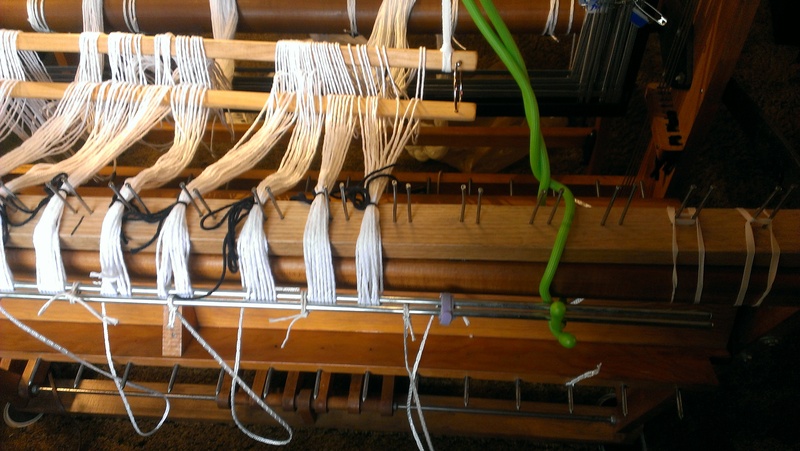 We worked on the design together, basing it on some ideas in the books I have, and customizing it to work with one of my Cricket loom with a 10 inch weaving width, a 12 dent heddle and 8/4 cotton carpet warp. Halie used a warping board for the first time to wind the two colors separately. She sleyed the rigid heddle holding the cross in her hand, first with the light color while leaving spaces for the dark color based on the warping plan we made. Then she filled in the dark color. You can see how the color sequence changes across the warp. The threading started out with a little bit of log cabin; alternating single ends of dark and light for about an inch, then alternating light and dark for a half inch, then back to alternating dark and light. After that, the sequences of dark and light changed to some other classic color and weave combinations. 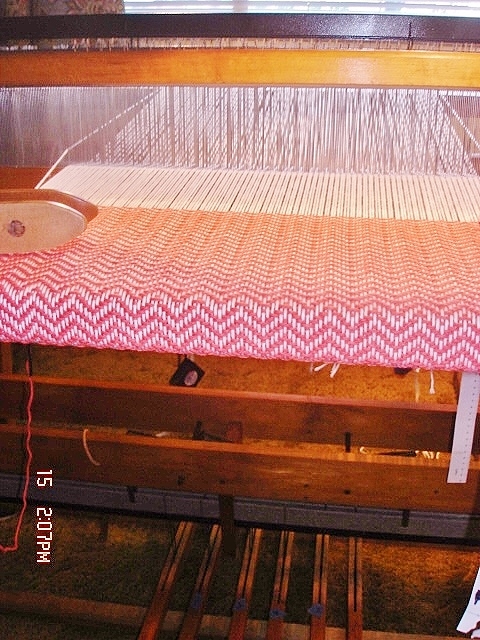 It was a short warp and the color sequence to weave the weft was the same as the warp. 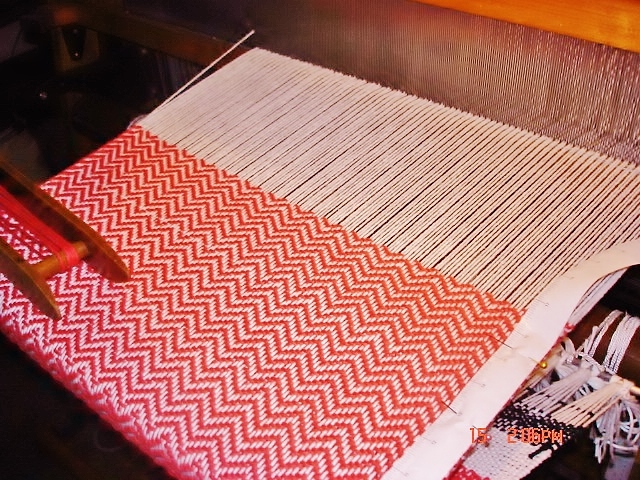 Multiple iterations of color and weave effects can be observed in one small cloth and the sample is to be used as a reference tool for fabric design. 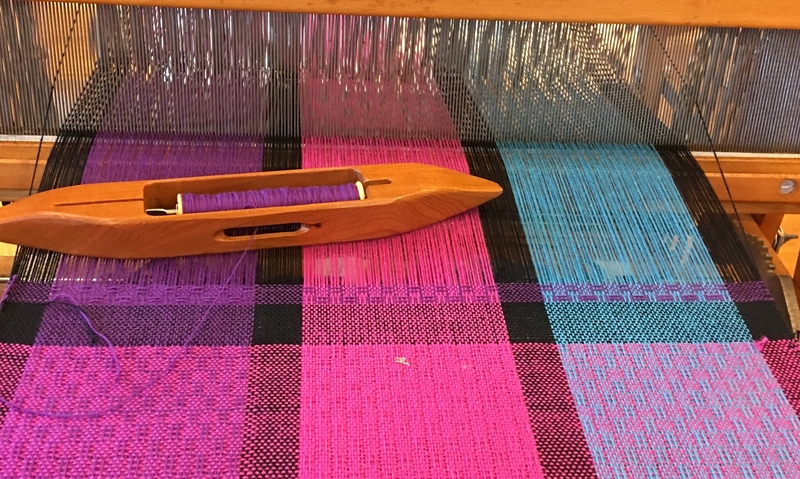 The sample was hemstitched on the loom, and now she needs to determine the edge treatment before the cloth is wet finished and pressed. I sent the classic Virginia West book, Finishing Touches for the Handweaver, with her for the weekend to select one. I am excited to see what she comes up with! I have 2 private lesson students starting this week. I love teaching new weavers. 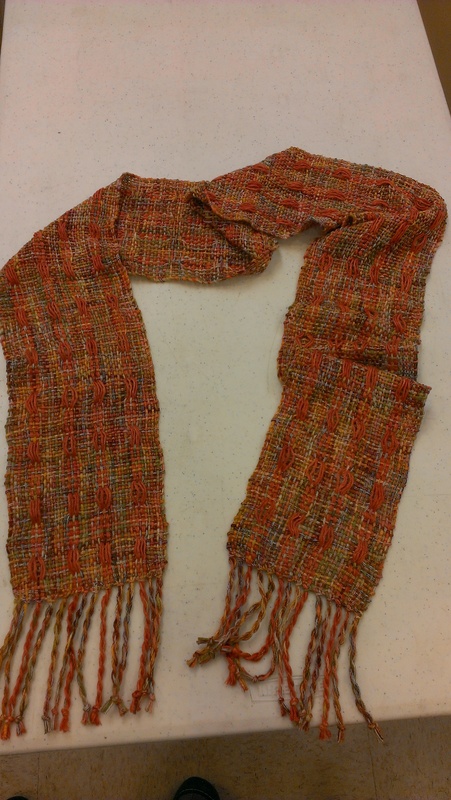 One has prior experience on a rigid heddle loom which is a great way to get started. 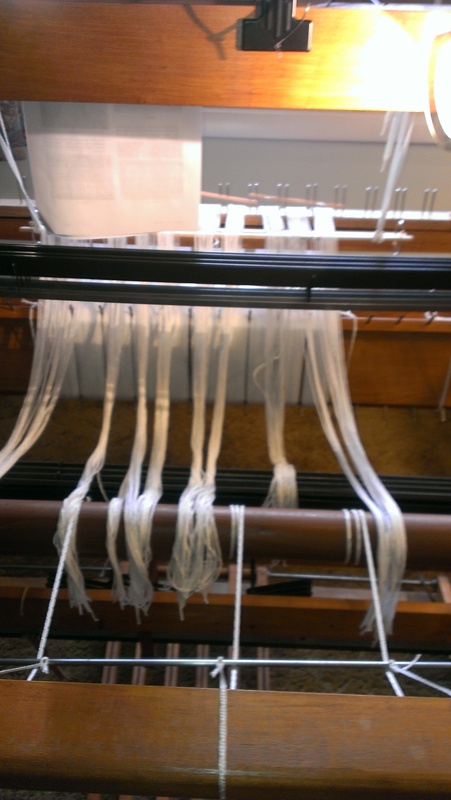 She has since purchased a used 4 shaft Macomber Loom that needed some TLC and has since restored it to nice condition. I met with her a few weeks ago to evaluate what she had, give her some advice on continuing the restoration, helped her put the brake pieces on properly and give her a list of things to buy or make that she needed before getting started. 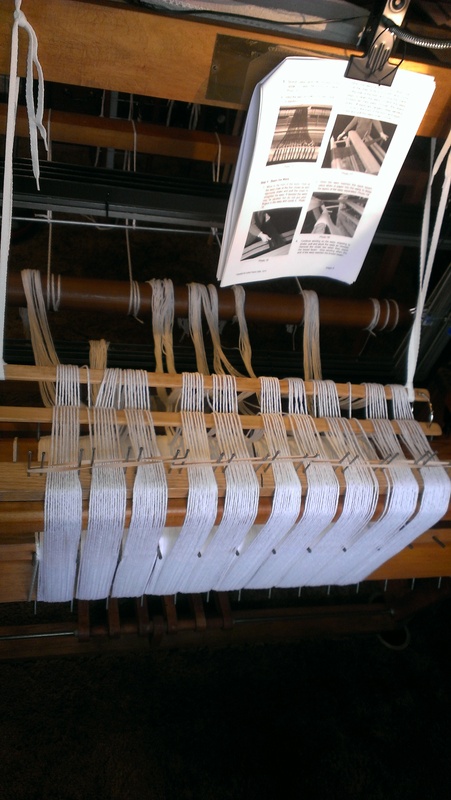 We met again this morning to start winding the warp for her first project which I call a get to know your loom project. 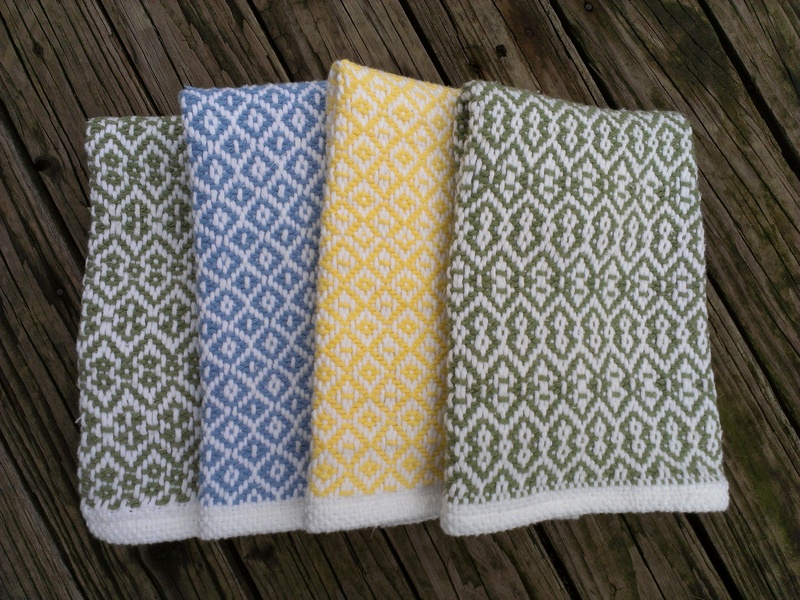 They can be hand towels or placemats. 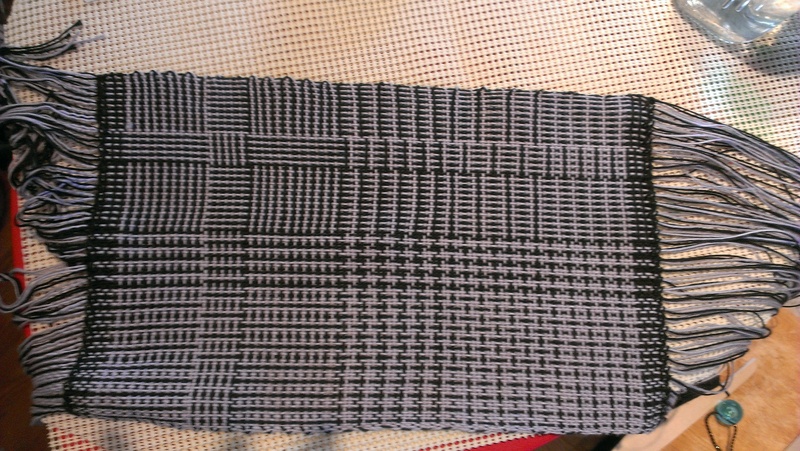 Tomorrow evening I am meeting with an art student at DAAP who wants to learn about weaving. I will start her on a rigid heddle loom and a beginner scarf. After one or two projects, I will rent her my 4 shaft Dorothy table loom and a few items to begin 4 shaft weaving. She doesn’t own any equipment yet. We plan on meeting twice a week through the month of July. I am really excited about it. If things continue this well, I may have to get another small table loom or floor loom for students. Once again, I forgot to to take pictures at the end of one of my classes. Today my “Tuesday Knitters” finished their felted clogs. One was a woman’s size and the other a child’s size. The child size pair was completely adorable. I may have to knit a pair just because they are cute, but sorry, no photo. 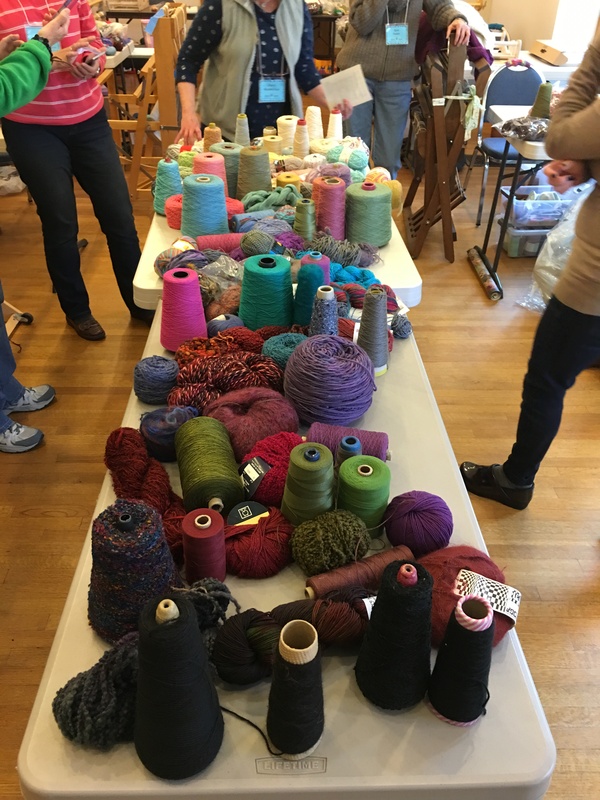 Last weekend, I did remember to take a picture at the conclusion of my Rigid Heddle Weaving class. It was a more advanced class and they wove my “Stripes and Floats” pattern. Click on the pics for a closer look.